Economist Carlos Marx Carrasco, first said that Sawyer Alvaro Noboa Ponton hadn’t left the country, and he asked for the reports of the Ministry of Interior, stating that there were no documents that proved that Lawyer Noboa had left the country. Afterwards, he is saying that Lawyer Noboa indeed left the country on March 15, five days before the Constitutional Judge granted him the habeas corpus, we really don’t understand what the Economist Carlos Marx Carrasco is aiming for, who is also showing a letter delivered allegedly by an Attache from the Investigation Office of the National Security Department of the United States Government. We have sent a letter to the American Embassy and the Consul, in which, we want to clear up this situation, we are attaching the video with the statements of Economist Carlos Marx Carrasco in which he mentions that the Attache of National Security delivered him this information. Lawyer Noboa, on Saturday, was in a social event; on Monday he was in Industrial Molinera; on Tuesday he went to work in his office and did so on Wednesday. Until, as I told you before, I called Lawyer Noboa to tell him that the Immigration Office had approved the order form the Judge. At least, you now recognize the existence of the habeas corpus; I want to clear up today that no Judge has revoked the habeas corpus, Lawyer Noboa has the right to leave and enter the country when he sees fit, there is no Judge that has revoked the habeas corpus. There is an official document from a tax collector of the SRI, which has no value, since the Constitution is very clear and provides that only a Constitutional Jude can prohibit the departure of an Ecuadorian. I have here, the official document form the Immigration Office, approved on March 20, which I delivered in the last press conference, and that proves that it was approved because the judgement was abided by the Immigration Chief of Guayaquil. Economist Carlos Marx Carrasco is now in a contradiction, if Lawyer Noboa left or did not leave the country; he has sent a letter from an alleged Attache from we don’t know what department of the United States, a false document because Lawyer Noboa did not enter the United States on March 15. We want for you to clarify, why you had not answered Ecuador, about your pretension to collect, only, from Bananera Noboa, for the fiscal year of 2005, almost $ 101 million, when the SRI only collected from Dole the sum of $ 700.000 for that same year. I have repeated, a thousand times, that the banana business is regulated in Ecuador, there is an official price for the bananas, there is a list in the Ministry of Agriculture in which are listed the producers to whom the product has been sold. You have never answered, and now we urge the Economist to explain Ecuador why he pretends to collect from Bananera Noboa $ 101 million, I spoke with him in Court when he went illegally to Court during a hearing of Bananera Noboa; he couldn’t answer my question, so, silence lends assent. It is evident that is a coarse and false accusation against Lawyer Alvaro Noboa, a disrepute from this Government trough Economist Carlos Marx Carrasco, pretending to harm the honor of Lawyer Noboa, who is a businessman that has given jobs to thousands of Ecuadorians in the country, who deserves respect. There is no problem here; is not a matter of corruption, is a matter of tax collection; that is the subject we are discussing, not if Noboa left or did not leave the country; anyways, he left the country, I repeat, with the habeas corpus granted by the Constitutional Judge, and not in March 15. Now he is saying that he used LAN as air transportation, after he said that there were no records of his departure, suggesting he left illegally; now he says he traveled by LAN. When he presents these documents, I repeat, we will deliver this video attached to a letter to the American Embassy for them to explain us who is this person, this Attache from the office of investigation, who has no business in this matter since Lawyer Noboa is not accused of corruption. Until now, he has been persecuted for an illegal tax debt, that pretends to collect $ 101 million, when from Dole, who sold more bananas than Bananera Noboa in 2005, only collected $ 700.000. Sylka Sanchez: well, Lawyer Noboa nas no restriction to return to the country, and he can come back any time he considers necessary, we, as his lawyers, have told him that there are no guarantees. But, as you know, las time, he returned to the country, there are risks that have to be taken. He has to work here because he is an important businessman, surely yo will see him back soon. Press: When would he return? Sylka Sanchez: we don’t know exactly; we, as his lawyers, have advised him not to return. We advised him last time, but he decided to come back. For now he has no restrictions and the habeas corpus has not been revoked by any Judge. There is an official document from a tax collector that has no competence. Press: Because of the official form the SRI, are you worried that Lawyer Noboa is considered a fugitive form justice? Sylka Sanchez: Lawyer Noboa has no detention order against him, were are discussing a subject of tax collection that is in dispute; and I ask again why the SRI pretends to collect from Bananera Noboa $ 101 million for the fiscal year of 2005, and from Dole, foreign company that exported more than us, Economist Carlos Marx Cararsco only collects $ 700.000 for the same year. This is illegal; there is an exception trial here in the Tax Court of Guayaquil; the SRI flies in the face of it, it continues to perform the assessments to conduct an auction. I remind Economist Carlos Marx Carrasco and to all the members of the SRI, that there is a right of contribution and we will continue to litigate and if they pretend to break the law they will have to go to national and international courts and respond, in due time, if they continue to break the law. Press: there is a way to prove that between the 15 and 19 of March, Lawyer Noboa was in the country? Sylka Sanchez: Lawyer Noboa went to a marriage with 300 guests, and he was a witness. He went to work in Industrial Molinera, there are proofs of that. But I am not here to presents proofs for that, is not my competence. I am her to ask Economist Carlos Marx Carrasco to show the press and deliver to us the alleged letter from the Attache of the investigation office of the National Security department of the United States Government, in which is stated that Lawyer Noboa entered the United States on March 15, five days before the lifting of the prohibition to leave the country. Besides, we are sending letter to the American Embassy for them to explain us about this matter; because Lawyer Noboa was in the country at that time, working, as usual, in his office located in Industrial Molinera. Press: Is not enough that the Immigration Office confirms the date of departure? Press: But, to speed up the investigations? Sylka Sanchez: Form which Immigration Office? Carlos Marx said, in his contradictory statements, that Lawyer Noboa hadn’t left the country, now he is saying that he did so by LAN on March 15. This is so contradictory, we really don’t know what he pretends. Maybe he is confused, we would like to think that he has been given false information. We have the right of reply, and we must assert our right and that’s why we are going straight to the Embassy so they can tell us if this person exists. You can go and ask LAN, or Economist Carlos Marx Carrasco, we are going to request those documents to the American Embassy. Press: Perfect, and with respect to the suspension of the Judge? 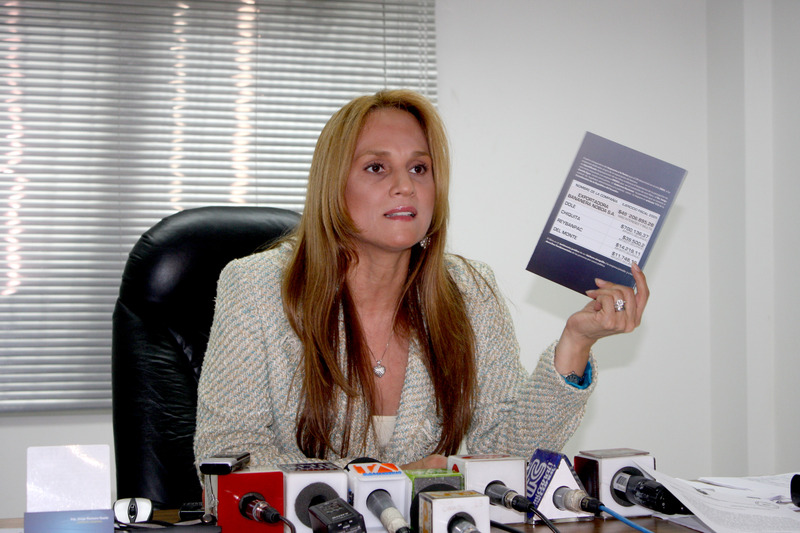 Sylka Sanchez: Is a shame that here in Ecuador, a Judge who does not abide Government orders is suspended. This cannot happen anymore in this country. These Judges, who are having these problems, are calling upon international institutions to defend their rights. The same happened in Venezuela; they put the Judges in jail, the ones who didn’t obey Chavez; they imprisoned all the public officials who didn’t do what the Government wanted, but there is no evil that hast a hundred years as there is no body that resists it.